Professionals within the boiler and pressure vessel industry are invited to submit presentation proposals for the 88th General Meeting in Salt Lake City, Utah, May 6-10, 2019. Informative and timely topics relevant to the boiler and pressure vessel industry are wanted for consideration. Submission deadline is October 1, 2018. 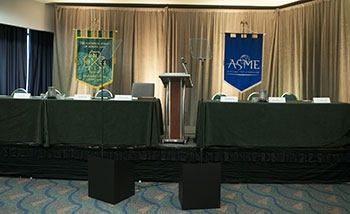 Past themes have included an ASME international update, inspection ethics, cross-industry relationships, industrial boilers, the welding sector, and lessons learned from the past. Submissions must be postmarked by October 1, 2018. Abstracts may also be emailed to wwhite@nationalboard.org by October 1. Presentations should be limited to 30 minutes. Speakers chosen to deliver General Session presentations will be notified by November 30, 2018. Each will receive one complimentary National Board registration packet, which includes one ticket to the Wednesday Banquet, as well as entry to the General Session, all guest activities, and General Meeting receptions. It is requested that speakers assume their own travel and hotel expenses.